The centrality of liveness to attempts to mediatize theatre is a main concern of this essay, which examines efforts to render theatre as theatre on screen, in mediatizations which aim to be theatre more than they aim to document it for the archive. I leverage theories from Wendy Chun and N. Katherine Hayles in order to argue for considering contemporary digital mediatizations of theatre not as valid or otherwise according to their attempts to preserve the vestiges of liveness, but as opportunities to explore how digitality, and especially the broadcasts and recordings it makes possible, might open up opportunities for theatre itself to mean differently. While Chun’s figure of the enduring ephemeral and Hayles’s notion of the flickering signifier do not arise from theatre or performance studies, they can provoke new interrogations of the seeming constitutive liveness of theatrical performance, the presumed stability of recorded documents, and the translation of different forms from analog to digital. All of these have direct bearing on how scholars might “read” and theorize digital renderings of theatrical productions, which mediatize highly visible stage productions for global audiences. The popularity of such productions give them considerable – and growing – power to shape the customs and standards by which theatre is assessed, produced, consumed, and even defined. Hayles’s figure of the flickering signifier, in particular, could equip performance scholars, as it has scholars of literature, to investigate contemporary shifts in the ways in which previously exclusively non-digital forms are instantiated across digital platforms. 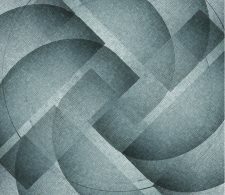 Perhaps more importantly, it emphasizes the opportunities for mutation and experimentation resulting from the new modes of signification those instantiations bring into being. I make a case, in this essay, for encountering recorded and broadcast theatre on its own terms, according to its unique valences and affordances, in hopes that a robust curiosity regarding such a theatre might spur audiences, practitioners, and scholars alike to investigate what exists beyond theatre’s strong correlation with live acts and fleshly bodies. Sabel’s comment about “go[ing] on location” points not to the actual portability of theatrical productions but to the intractability of the dilemma of translating those fleshly bodies and their theatrical environments into satisfying screened forms. Given the seeming insolubility of the mismatches between what suits the theatre and the screen, respectively, and what each requires, perhaps those who would record theatre would do better to throw in the towel and make a film – or at least move to a soundstage.7 However, while soundstages are easier to record in, removing a play to a soundstage is never a simple or trivial change of venue. Instead, such a move represents a nearly global change to the theatre’s constitutive contexts. The particular repertoire of actions and responsibilities that create theatre give way to the myriad (and equally specific) practices which shape and constitute recordings. While the necessities of light and sound (and cameras and microphones) probably represent the most immediately apparent differences between the soundstage and on a theatrical one, any actor can tell also you of the practical difference between hitting marks for a camera and the relative latitude and variability involved in executing stage blocking, related skills that are still distinct enough to require separate and specialized training, and which constitute specific and meaningfully dissimilar performances – which are then apprehended by audiences according to distinct repertoires of consumption. The prospect of recording in situ, from the playing space itself, with audience intact and no or minimal accommodation for the camera, also represents significant intrusion into long-standing conventional theatrical processes. The logistics and aesthetics of inserting and integrating cameras and microphones into theatre spaces (including those spaces’ available light and particular acoustics) have long been troublesome. The size and bulk of analog film cameras poses difficulty, which, along with their requirements for available light, has historically made them prohibitive for use in theatres. Smaller television cameras are less unwieldy than film cameras, allowing for in situ telecasts of theatrical productions like the ones broadcast by PBS’s Live from Lincoln Center (and in the UK, by the BBC), as well as studio-produced “plays” for television like those featured on hour-long drama anthology programs like Television Playhouse and Westinghouse Studio One in the 1940s and 50s. Even on occasions when smaller cameras entered the theatre, however, the consumption of televised plays still traded the co-present bodies of an audience sharing the theatre for the isolated cells of private homes. 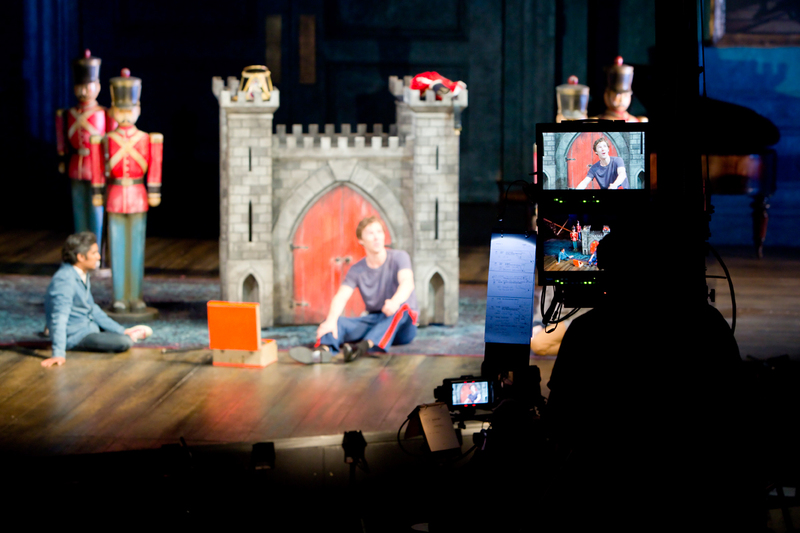 When a new process called Electronovision promised to be able to record theatre in situ, with only minor adjustments to available light, and for consumption by a communal cinema audience rather than a private televisual one, it was billed (in a trailer for the resulting film) as an innovative technical “miracle.” The 1964 Broadway production of Hamlet, directed by John Gielgud and starring Richard Burton was Electronovision’s proving ground: the production was recorded inside the Lunt-Fontanne theatre and then shown in cinemas throughout the US weeks later. The trailer for the film touts its authenticity in a barker-like voice over: “See the original New York production, with the all-star New York cast, presented in its entirety in this [movie] theatre through the miracle of Electronovision! For the first time in history, you will see a live Broadway hit in your own motion picture theatre.” Perhaps tellingly, the text on screen places the word “live” within quotation marks, but the intended take-away was clear: audiences were to understand this product not as a piece of cinema, but as theatre – or at least as the innovative hybrid implied by the new product’s name, Theatrofilm. Anticipating the objection that no canned reproduction of theatre could ever hold the same ontology as the presumably im-mediate real thing, the pitch Burton himself offers in the trailer promises not only a thrillingly innovative technology, but a remarkable ability to preserve a sense of theatre-ness: “This has never happened before. The immediacy, the sense of being there, is unlike any experience you have ever known. This is the theatre of the future, taking shape before your eyes today. And you will be there, part of this historic first.”8 The miracle was actually a glorified kinescope process, in which video cameras placed inside the theatre relayed moving images to a truck outside, where the video monitors were filmed. The resulting film record of the performance could, although it was of significantly lower quality than a native film record, be projected in cinemas. Fig. 1: “The Electronovision Process,” author’s collection. INTERVIEWER: Will we get the immediacy of the live Broadway production of Hamlet when this is translated onto Theatrofilm with Electronovision? It perhaps goes without saying that, in actuality, the production of the Theatrofilm involved more than a few “concessions,” and even some “cheating.” The product, while not particularly cinematic, was edited together from three different recorded performances, and so represents no single performance that a present audience member could have seen during a night at the theatre. While it eschews “trick shots” in general, the cameras do pan and zoom, and the final version includes at least one camera angle that represents an upstage point of view unavailable to the audience (see Fig. 1). Unsurprisingly, the Electronovision Hamlet is less than completely felicitous in its commitment to forswearing filmic interventions in favor of a transparent mediatization of the live theatrical original. The truth or falsity of Burton’s claim may be of less interest than the rhetoric he uses to make it; as W. B. Worthen observes, it was never so much Electronovision’s “technology” that was “seductive,” but its “virtualization of liveness.” That liveness is “a category of experience produced by recording technology,” as Worthen notes, but also a quality which is repeatly negotiated through language. In the interview, Burton somewhat paradoxically claims that Theatrofilm is, or is as good as, theater because of how it mediatized theatre, or more pointedly due to how it did not. The most important arguments for the Electronovision Hamlet being received as theatre, or as more attached to theatre than film, emphasized seemingly vital aspects of theatricality. These included the specificity of the Lunt-Fontanne stage, and the vulnerability to mischance described earlier, but also the amassing of a co-present audience to view the production on the large screens of movie theatres, rather than individually via the intimate and relatively isolated domesticity of in-home televisions. Electronovision offered a novel taste of in situ recording that could be projected in the cinema, making use of the cinema’s communal audience and the form’s potential for spectacle – even if the rather grainy result was, in the end, disappointing in many of the ways David Sabel enumerates in his critique of recorded performance. 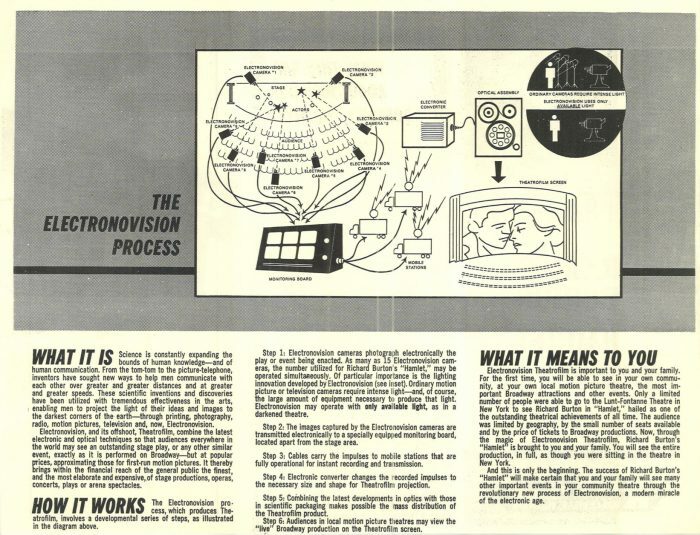 Arguably, the real innovation of the “miracle of Electronovision” was its integration of live-to-tape television techniques with a delivery medium – film – which would allow the resulting record to be shown in a movie theatre, where the spectators made for a better analog to the theatre’s audience than did the distributed, domestic audience of television. The liveness of the audience’s consumption, moreover, was elevated by a kind of forced evanescence, or at least scarcity, that the producers engineered for the product by announcing a plan to remove the filmed record from circulation after its limited run (four showings) in cinemas. Burton, in the interview cited earlier, mentions the public showings and then rather uncertainly adds that afterwards the film “will never, possibly, be shown again” (emphasis added).12 The film was removed from circulation, if not permanently; it remained largely unavailable to the public for decades before it resurfaced. Though a few prints remained in various library archives, the film was not shown in cinemas again, nor was it offered for sale to consumers until its 1997 release on DVD and VHS.13 The Electronovision experiment was pointedly not an exercise in preservation or documentation, although it did eventually emerge as a widely available document; rather, part of the strategy to secure a kind of theatrical temporality for the showings of the Electronovision recordings was to ensure their scarcity via this planned disappearance. What emerges from an examination of the various strategies by which the Electronovision recording attempted to attach itself to a popular imaginary of theater is the picture of a process fundamentally at odds with itself: a recording process that advertises, as its strength, that it is as little like a recording as possible, though it declines to fully exploit film’s cinematic artistry and its relative iterability. Also of interest, though, is that rhetoric’s implicit declaration of how the name of theatre is negotiated: primarily, it seems, through gestures toward various aspects of liveness. If the Electronovision Hamlet is notable in its attempt to innovate a mediatized theater substitute that, as much as possible, worked to efface the usual conditions of mediatization, it is equally striking for its reification of conventional theatrical bona fides like publicness, liveness, contingency, and ephemerality. In claiming to be “the theatre of the future,” Electronovision also contributes to defining theatre for the future, in relation to this set of attributes. The strategies producers levied in order to attach the Electronovision Hamlet to live theatre worked diligently against the reputation films and other recordings carry for stability, iterability, and permanence; however, the film has neither vanished nor persisted so much as it has flickered between presence and absence, including in ways producers could hardly have schemed. As of this writing, a surprising amount of the film is available carved into chunks on YouTube, where it exists not as a cohesive whole or stable destination, but as a series of disparate, possibly temporary clips which are undependable and add up to less than the entire record. In a more spectacular example, the digital record of the film became the source material for a 2007 production by the experimental performance ensemble The Wooster Group, in which the performers playfully attempted to re-enact the production live on stage by mimicking the recording, while a manipulated version of the Electronovision film was projected onto various onstage screens. By re-enlivening a recording, The Wooster Group mischievously reversed video’s usual documentary strategy, but they also interfered with and adjusted the video before attempting to embody it. In an uncanny resonance with Phelan’s concern with disappearance, in their treatment of the Electronovision reproduction of Hamlet, individual performers from the 1964 recording are wholly or partially erased from some scenes, others more made more faint, and the meter of the spoken verse altered by manipulating the actors’ digitally rendered speech – making manifest Sean Cubitt’s assertion that if video is a medium for recording, it is also necessarily “a medium for erasing.”14 Though practitioners and audiences alike are perhaps used to thinking of video as the canned, storable, and dependable other of live performance, the Wooster Group’s performance demonstrates video to be hardly impervious to intervention and loss, even disappearance. As Worthen notes, the Wooster Group Hamlet reveals the Burton Theatrofilm as “both rewritten by and incapable of determining its [own] performance.”15 Their project – as well as the recording’s history and provenance more generally – suggest that what is most theatrical about video recordings of theatre may be those recordings’ ability to impersonate permanence, to costume themselves in the outward character of stability. The digital’s potential for rapid replenishment and nimble dispersal of copies far outstrips the limited reproduction and diaspora of the Electronovision Hamlet, but the Theatrofilm has nonetheless managed to endure rather ephemerally according to Chun’s model. It has survived not due to an inherent permanence but to the multiplicity of its vulnerable copies, including the surviving prints and the negative unearthed at Warner Brothers, but in particular its digital forms: privately held DVDs, and especially and the clips and copies available on online, where the Electronovision Hamlet’s digital existence is “constantly refreshed” in a manner that overcomes the analog film’s near extinction from the commercial market. While Chun’s model theorizes the digital, its focus on the ways in which digital media is subject to degradation and disappearance suggests shared vulnerabilities, rather than stark opposition, between both analog and digital documentation of live performance – and also, importantly, between those forms of documentation and live performance itself, as all of these are inevitably subject to loss. However, as with the Electronovision Hamlet, the realities of of persistence and disappearance are less manageable than producers intend, and the safeguards less sure than they might like. Wendy Chun could well be speaking of the illicit torrents of NT Live recordings that inevitably circulate online when she reminds readers that though “the internet is available 24/7,” online content constantly disappears and reappears, “often to the chagrin of those trying to erase data.”20 When Benedict Cumberbatch fans’ avid trading of illicit copies of his performance in NT Live’s Frankenstein prompted David Sabel to make an official statement on bootleg recordings, he sounded less chagrined than authoritative as he reminded fans that “if you choose to record, distribute or download the screening of Frankenstein, you are breaking the law and risk legal action.”21 The collectivity and sense of occasion invoked by Barker’s eventness is positioned by the National as vital to their model for broadcasting theatre; the same official statement discourages illicit home-viewing not only by threatening legal jeopardy, but by reaffirming the Nationa’s desire “to emulate the theatrical experience as much as possible” through a “big screen, collective cinema experience [which] comes as close as we can get to the original theatrical event.”22 In other words, the fans trading files of Cumberbatch’s performance online are not only breaking the law, but also doing the entire enterprise a disservice by making it un-theatrical, by rendering the recording privately enjoyable and massively accessible. In their attempt to strictly control where, when, and how the recordings may be viewed, producers seem to invoke Phelan’s requirement that performance be available only to “a limited number of people in a specific time/space frame” (even if in the case of NT Live that frame is quite an expansive one). In this case those limitations place the licit performance event – in this case, the screened broadcast, not the stage production – at a premium, granting it additional value within the economy of reproduction of which Phelan is so suspicious. Still, both Sabel’s warning and von Sychowski’s call for a more robust conversation about the realities of piracy suggest that the National and other producers will continue to contend with digital data’s tendency to endure unpredictably, to mutate, vanish, or multiply. Phelan suggests that “live” performance’s disappearance allows it to elude regulation and control in ways recordings could not, but in this context disappearance and reproduction seem similarly unruly, similarly elusive. The realities of piracy make clear that while neither live performance nor its digital reproduction can escape commodification, the latter might actually be adept at resisting conventional strategies of profit in ways Phelan’s argument could not anticipate. Despite the high demand (and in many cases price), for event-based experiences featuring Benedict Cumberbatch and his likeness, his digital performances continually flicker anew as massively multiple, mobile copies oscillate between presence and absence online. Fig. 2: Benedict Cumberbatch in camera rehearsal for NT Live’s Hamlet, 2015. Photo credit: Ludovic des Cognets. Given that recordings, and especially digital ones, of theatrical productions seem to have a significant relationship with disappearance and precarity, it is worth pondering the extent to which the process of digital translation to the screen, from Electronovision to NT Live, is driven by the effort to prioritize those vulnerabilities as uniquely foundational to the ontology of theatre. What other kinds of hybridity, literacies, and meaning-making might the affordances of video make available to theatre if liveness and contingency were not an obligatory attribute pursued so doggedly? Meaningfully, however, Hayles never considers literature imperiled by the advent of electronic texts. Rather, she points to the inevitabiltity of new technologies “instantiat[ing] new modes of signification” – a radical shift, according to Hayles, but an not an ontological one.30 She recognizes the overwhelming importance and significant implications of this “important shift in the plate tectonics of language” without invoking the ontological underpinnings of literature, writing, or reading.31 To be quite clear, her argument centered on books and texts does not map perfectly onto theatrical practices translated from stages to screens; the particular and peculiar ways embodiment has traditionally created the theatre is as significant as it is specific to theatrical performance. Too, questions of liveness as well as of embodied presence register very differently in theatre, as a time-based form, than in literature. Still, it is helpful that when Hayles speaks of literature encountering the flickering screen in the place of the paper page, she speaks in terms of information and signification rather than ontology, despite the long tradition which links the particular materiality of paper and books to practices of writing and reading. Rather, Hayles’s concern is with the way new modes of signification constitute a fundamental alteration to the relationship between signified and signifier. The resulting flickering signifiers carry the instability of Lacan’s floating signifiers a step further, placing at the core of signification not a tension between presence and absence, but a distinction between pattern and randomness.32 In Hayles’s de-centering of the Lacanian binary of presence-and-absence in favor of this tension between pattern and randomness, performance scholars might find a paradigm which is helpfully disinterested in defining performance in terms of present, corporeal bodies, and an inevitable, fundamental disappearance. Rather, informatics’ preoccupation with pattern and ramdomness might help scholars to address digital recordings and live acts according to their shared affordances instead of presumed opposition, and to see the live theatre’s translation or transposition to the digital more as a conversion of state than an abrupt rupture of ontology. The resulting theatre could be one for which liveness, whether figured as a vulnerability to the vanishing moment or the co-presence of performing and spectating bodies, may be present but does not function as a sine qua non which must be approximated even by forms of theatrical performance which have less affinity for it than does the stage. Within theatre and performance studies, Phelan’s landmark assertion of disappearance as the ontology of performance has often meant that questions of liveness become questions of ontology and taxonomy: what “counts” as theatre, what to call mediatized performance, how to classify it, and by extension how to critique, teach, and value it. The question of digital media’s potency or utility – that is, not the widely accepted utility of digital video when it comes to producing documentation of live events for the archive, but the opportunity that digital technologies, including video, present to re-figure complex systems of representation and reception – has been less fully explored. Certainly, there is no shortage of accomplished voices examining the deep imbrication of the digital with putatively “live” performance; contemporary scholars in media and performance have built an impressive body of theory which effectively troubles any reflexive opposition between the two. Similarly, an exciting body of directors, performers and ensembles –the Wooster Group, but also Big Art Group, The Builders’ Association, Blast Theory, Katie Mitchell, and Jay Scheib – explore the possibilities for recording media to intersect with theatrical liveness in more emphatically intermedial works in which, as Greg Giesekam has written, “the interaction between the media” is emphatically not transparent, but “substantially modifies how the respective media conventionally function and invites reflection on their nature and methods.”36 However, while such intermedial performance may challenge conventional notions about mediatization and liveness, far less often does it trouble the idea of performance work itself as time-bound and event-based. Generally speaking, while the artists cited above create work that is more easily legible as provocative and innovative than NT Live is, most of them consistently maintain a clear ontological distinction between the performance event and its documentation. This is a distinction that NT Live and similar endeavors rather pointedly imperil, or even threaten to collapse. 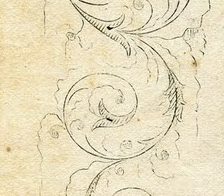 Though their aims at transparency and fidelity mean that they do not overtly solicit or provoke the reflection that Giesekam describes above, products like NT Live do productively trouble prevailing understandings of theatrical performance as necessarily bounded by time and space. Even as producers mobilize strategies to create “eventness” for such products in order to certify them as event-based theatrical performance, the pervasiveness, wide availability, and slippery online mobility of those same products implicitly destabilize the claim that theatre must be an event, and that “mere” copies exist as categorically secondary documentation which, following Phelan, do not hold the properties or potential of performance itself. Despite this, the particular practice of broadcasting/streaming/recording/relaying performances from the stage has failed to capture the attention of media and performance scholars in the way that overtly experimental performance has.37 It is easy to surmise that the generally traditional content of the highest profile examples of this practice – NT Live, the RSC’s Live from Stratford-upon-Avon, and even Branagh Theatre Live, the broadcast series of Kenneth Branagh Theatre Company, which recently took the moderately daring step of broadcasting its Fellini-inspired Romeo & Juliet in Fellini-esque black-and-white – might not be particularly compelling to critics and theorists concerned with cutting-edge interactions of performance and media technologies. To speak very generally, many of us who study media and performance tend to be more interested in interruption than conservation – and although I argue for understanding them as more subtly subversive, most broadcasts and recordings of the type analyzed here do appear to conserve and foreground a remarkably traditional theatricality. Hayles’s model is particularly useful in this light, as its insights hold regardless of the canonicity, conventionality, or experimental nature of the text (or productions) to which scholars might apply it. Because Hayles’s model works at the level of information, it might provide a paradigm which encourages scholars to read digital theatrical production with an eye toward how the translation itself is necessarily remaking theatre by reconstituting the practices by which signification occurs, thus infiltrating and re-making the codes that govern representation. Though intermedial experimentation is generally outside the mission of most broadcast series, the considerable popularity and extensive reach of digital translations of stage work suggests that they merit attention, not least for their considerable power to communicate to (or define for) a massive audience what theatre is and how it does its work.